Before you commit to any of our classes, we invite you to try your first class for FREE. For more information, class times and registration please contact Woody McMahon at 703.628.2880 or via email to woody@sequoiahealth.com. Please click here for our complete class schedule. Tai Ji Quan: Moving for Better Balance® is a fall prevention program that has been shown in clinical studies to reduce the incidence of falls by over 50%. Each class is based on modified Tai Chi movements that help improve your balance, lower body strength and posture stability. This is an excellent class if you have balance problems or have fallen, are concerned about falling or scored a medium to high risk on your falls prevention screening. This class meets twice a week for all students. Posture Perfect!TM classes are a safe and effective osteoporosis and osteopenia solution. We use targeted exercises that help strengthen the hip and spinal muscles and bones to reduce osteoporosis and osteopenia related fractures. The exercises also improve balance, another important factor that helps keep fracture risk low. The program was co-developed with Sara Meeks, PT and is safer and more effective than other exercise programs such as traditional Yoga, Pilates or weight machines. This class meets once a week for beginners and twice a week for advanced students. Our Better Backs!TM classes approach back pain differently by emphasizing posture correction, improvement in hip and leg flexibility and muscular relaxation activities. In our experience, back pain is the result of too much sitting, a lack of flexibility, poor posture and high stress levels. Relaxing the muscles of the back, hips and legs improves your lower body flexibility and alleviates pain. Many of the exercises come from Sara Meeks, PT and are an excellent back therapy tool. This class meets once a week for beginners and twice a week for advanced clients. Our Brain GamesTM classes use Ping Pong and other movement activities to stimulate five important parts of the brain while improving your agility, balance, concentration, speed, hand-eye coordination and stamina. 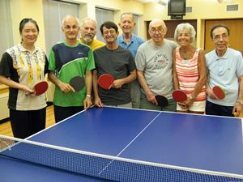 Dr. Oz, along with other brain health experts, have determined that Table Tennis is a fantastic way to stimulate both the health of your body and brain. A stronger brain is a healthier brain and keeping your mind sharp is an important part of having fun and enjoying your life to the fullest. This class meets once a week and is especially good for people with Parkinson's, Alzheimers and other cognitive disorders.